The Springbank Off-stream Reservoir is a dry reservoir that will store water temporarily during a flood. 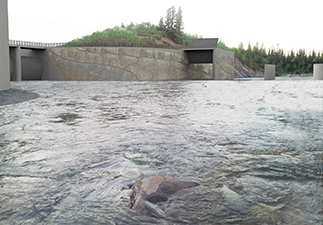 The Springbank Off-stream Reservoir (SR1) will work in tandem with the Glenmore Reservoir in Calgary. Together, the combined storage capacity would accommodate water volumes equal to the 2013 flood. On January 29, 2019, the Alberta government announced it had acquired 188 hectares (465 acres) of land needed to build the Springbank Reservoir project. "An agreement has been reached between my family and the Government of Alberta for the transfer of about three quarter-sections of our land and the relocation of our ranch in Springbank, Alberta. We took this step with the government for several reasons. First, the agreement with Alberta significantly protects and preserves heritage ranch lands and buildings, some of which have been in our family for 5 generations. Second, the burden of living under the cloud of the proposed project has been heavy. We needed certainty for our children and grandchildren. This agreement creates that certainty. Finally, we have a number of ranch employees that are like family to us who deserve to know what the future holds for them." "We understand that the decision to pursue the Springbank Off-Stream Reservoir was not an easy one for the Government of Alberta. It has not been easy for us either. However, we understand the government’s need to protect communities from devastating floods like the one that happened in southern Alberta in 2013. Governments must make tough decisions sometimes, and we respect the steps taken to resolve this very complicated issue." "We will not take any questions or comment further on the Springbank Reservoir. It is time for our family to move on and focus on our futures." During a flood, a diversion channel carries water from the Elbow River to the off-stream reservoir, which would have a storage capacity of 70.2 million cubic metres or about 28,000 Olympic-sized swimming pools. When peak waters have passed, an outlet structure safely releases the water back to the Elbow River in a controlled manner. The Springbank Reservoir will work together with the Glenmore Reservoir, which has 10 million cubic metres of available flood storage, to achieve the level of protection required. The reservoir will be approximately 15 km west of Calgary near Springbank Road, north of the Elbow River and predominantly east of Highway 22. See the May 2018 Public Information Session Boards (PDF, 11 MB) for more details. A diversion structure, with several components that work together, controls how much flood water enters the diversion channel. The diversion channel then carries flood waters to the storage reservoir. The channel is about 4.5 km long and has a bottom width of 24 metres. The channel cut would be similar to an irrigation canal with side slopes of about 3:1 (horizontal:vertical). It will generally be vegetated with native species; erosion protection may be provided at select locations where fast water speed is anticipated. The total area within the project perimeter is approximately 3,870 acres, including road allowances, structures and the maximum extent of any backwater during emergency scenarios. This perimeter also includes surplus borders around the various components of the infrastructure that may or may not be required as the precise location of the components is defined through additional engineering assessment and design. The reservoir's full supply level is achieved when it is storing the 2013 flood event (water elevation 1,210.5 metres, based on current conceptual design). Based on the current dam location this flooded area would be approximately 1,950 acres. Protecting Calgary and other downstream communities from the inevitable damage of another flood along the Elbow River remains a priority for the Government of Alberta and getting the Springbank Off-Stream Reservoir approved remains a primary focus for Alberta Transportation. Alberta Transportation is working to provide supplementary information to regulators. During this time, the Government of Alberta is also continuing engagement efforts with First Nations, landowners, Rocky View County, the City of Calgary and other stakeholders. Alberta Transportation is responsible for the project development, applying for regulatory approvals and, once received, construction. Once construction is complete, Alberta Environment and Parks is responsible for the reservoir’s management and operations. Stantec Consulting has been retained for the design, engineering and the Environmental Impact Assessment (EIA). An EIA is required for various environmental regulatory processes and is now underway. Information gathered during the EIA process is used to evaluate the potential positive and negative effects of a proposed project. Learn more about the EIA by reading the Terms of Reference (PDF, 85 KB). On June 23, 2016, the Canadian Environmental Assessment Agency (CEAA) announced that a federal environmental assessment is required for the Springbank Off-stream Reservoir. Engagement with stakeholders, including landowners, municipalities, Aboriginal communities, infrastructure companies and others has been ongoing throughout the project and will continue as it progresses. In October 2015, government announced it would move forward with the Springbank Project, combined with upstream local flood mitigation, to reduce the impact of flooding on the Elbow River. In June 2015, Alberta Environment and Parks commissioned the Dutch research foundation Deltares to review the original infrastructure proposal reports and a subsequent benefit/cost study for flood mitigation work on the Elbow River and provide a recommendation on which project to take forward to construction-ready status.